Comments: Evergreen broadleaf native to Australia. Leaves are dark green, lanceolate with a cordate base, sessile and arranged opposite on the branchlet. Gumnuts are warty and glaucose. Flowers are cream colored. 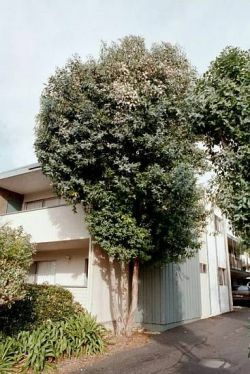 A short low branching tree or shrub. This tree is tentatively identified as E. apodophylla.